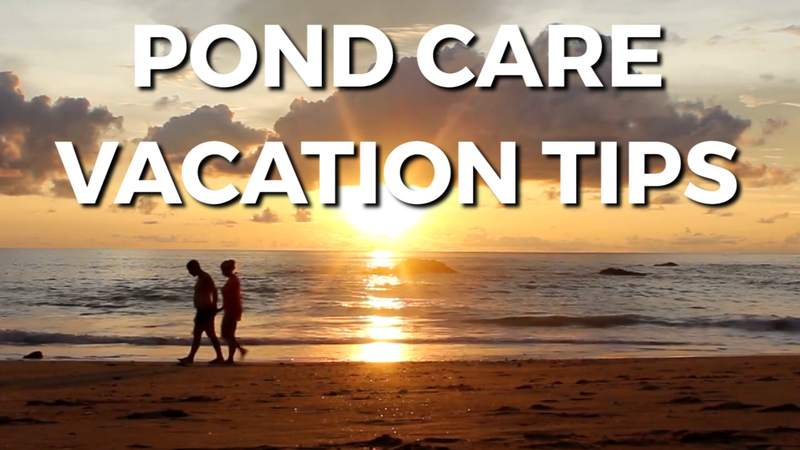 Pond Care Vacation Tips Koi and goldfish are just fine without food if you;;ll be gone for a few days. But, if you'll be gone for an extended period, 1-2 weeks, you should have someone take care of it. Koi and goldfish are just fine without food if you’ll be gone for a few days. But, if you’ll be gone for an extended period, 1-2 weeks, you should have someone take care of it. Pond-sitters are notorious for overfeeding while you’re gone. A tip - Prepackage the food in zip-lock bags. Put just enough food into each bag for one feeding and clearly mark each bag with dates. Hide the rest. Overfeeding creates excess organics in the pond and can wreak havoc on water quality. If prepackaging food is not your thing or you don’t have a pond-sitter, slow release feeder blocks are available. These blocks last up to 7 days. Since your pond level can drop through evaporation and splashing, Auto-fill valves can be a nice addition. Generally, installed inside the skimmer box- They are used to maintain proper water levels by automatically filling the pond if it drops to an unsafe level. If no one’s around, there’s no one to fill the pond. Most importantly, do a water change and add beneficial bacteria before you leave. Hope these tips are helpful. I’m Joe from webbsonline.